Note: The cruise departs from Gothenburg/Stockholm at 09:00 and arrives at its destination at 16:00 on Day Four. On arrival at Gothenburg Landvetter airport, a transfer is included to take you to the Hotel Vanilla. Free time in Gothenburg to explore the city. Gothenburg boasts six Michelin starred restaurants, as well as many more superb cafes and restaurants, serving fresh local cuisine and innovative menus. For lunch the bustling Feskekorka (fish market) or the Saluhall (food market), offer the opportunity to sample local, seasonal produce as well as savoury and sweet delights. Here, tasty fish soups and open crayfish sandwiches are the order of the day. After breakfast, self-transfer to the Gota Canal pier in Gothenburg. Depart Gothenburg at 09:00 and cruise along the canal to the town of Trollhattan, 70km north east of Gothenburg. The cruise then continues to Lake Vanern - Sweden’s largest lake and the third largest lake in Europe. At Trollhattan there is the opportunity to visit the Canal Museum or to spend time wandering along the canal banks and around the beautiful old lock area. The cruise then continues to Lake Vanern – Sweden’s largest lake and the third largest lake in Europe. Crossing Lake Vanern during the night, guests will wake to find themselves entering the Gota Canal. Throughout the day the cruise gently travels along the canal, passing Lake Viken before resting by Karlsborg Fortress on Lake Vattern. A guided tour of the fortress is available. 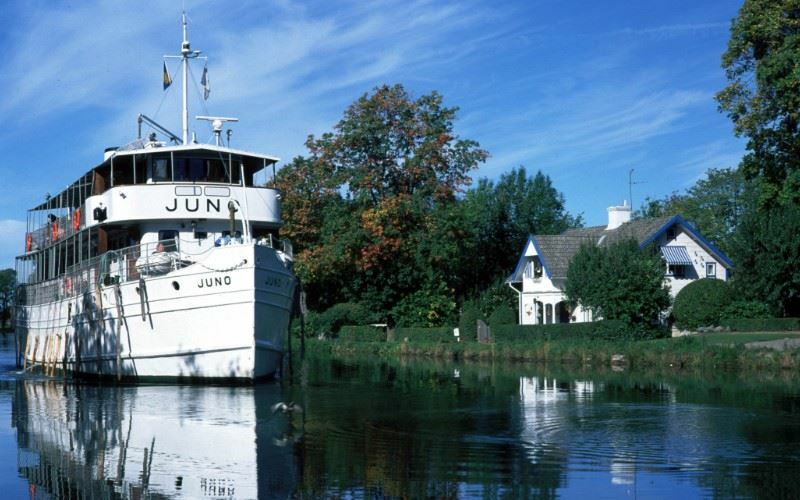 The cruise continues across the lake to Motala, the capital of the Gota Canal, where guests can visit the Motor Museum and the grave of Baltzar von Platen – the canal was his brainchild. After an early departure from Motala, the cruise stops at Berg, home to the old convent church of Vreta. In the afternoon the cruise continues to the spa town Soderkoping (free time to explore) before reaching the Baltic Sea. A guided tour of the church and the remains of the original convent are on offer to guests. Alternatively, there is time to enjoy a stroll along the canal or a swim in the waters of Lake Roxen. Early risers can enjoy the sight of the cruise boat weaving its way through the archipelago and negotiating the Sodertalje lock, the largest lock in Scandinavia. At 09:00, the cruise reaches the island of Bjorko in Lake Malaren renowned for its rich flora and beaches as well as for the Viking town of Birka, declared a UNESCO World Heritage Site. A guided tour of the island is available. The cruise ends in the old town of Stockholm at 14:30. Self-transfer from the Gota Canal pier in Stockholm to the Hotel Freys. Free time in Stockholm. Opportunity to explore the city’s museums, shopping streets, food markets, open parkland and extensive archipelago. For a first time visitor to Sweden’s capital, we would recommend the 50-minute Royal Canal cruise which passes the National Museum, Strandvagen (one of Stockholm’s most exclusive addresses), the Eco Park at Djurgarden, the Vasa Museum and the Royal Palace. Not only is this a great way to orientate yourself and inspire further explanation, but the audio guide provides interesting facts about the city. Morning at leisure. In the afternoon, a transfer is included to take you from the Hotel Freys to Stockholm Arlanda airport. Situated off Vasagatan in the heart of Stockholm, the Freys Hotel is just a stones throw from the city's main shopping streets and Arlanda Express train station. Situated off Vasagatan in the heart of Stockholm, the Freys Hotel is just a stone’s throw from the city’s main shopping streets, the central train station and the Arlanda Express terminal. Recently renovated, this hotel offers a comfortable and well-positioned base from which to explore this historic city. A Belgian restaurant, hotel bar and inner courtyard garden await guests after a day’s exploration. ‘Belgobaren’ Belgian restaurant and bar. Reservations recommended. Note: Sunvil recommends the superior rooms.